Planning a corporate picnic or a corporate event? If so, where do you begin the planning process? There are so many things to consider. Will workers bring children and spouses or come alone? Will you serve food, prepare food, or have catered foods delivered? Do you need rental equipment (chairs, tables, fans, tents, etc)? Depending on the answer to these and other questions, knowing how to go about the planning process is of utmost importance, to ensure your event goes off without a hitch. We specialize in these specialty events at Big Lou's Bouncies! We have a dedicated team waiting to help you plan the perfect picnic for any group of people. Let us put the many years of experience we have to good use, and help plan the perfect event. We have fun bouncers and activities for the kids who will be attending, so everyone will have a great time. 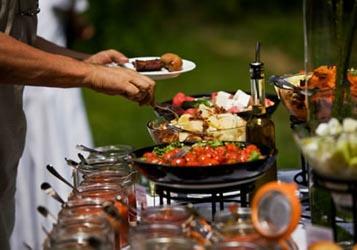 Do you need catered food or do you want to set up concessions you know all guests will enjoy? We can also step in to help on this front as well. Let us handle everything you need done on the day of your event. From setting up and breaking down, clean up, preparing food and serving guests, to bringing the talent and fun activities for all guests to enjoy, we will do it all. And, whether it is a small intimate group, or a mid size corporate event with 500 employees and family members, we have a team in place to handle these larger gatherings for your company. For a 300 person event, our typically price range is about $2500. But, this isn't set in stone; in fact, we have done smaller group gatherings, and many events with far more guests. We can provide you with a price quote for your corporate event based on the needs for your company. Give us a call so you can speak to a specialist planner today! Not only will they walk you through the event, they will also inform you of all costs, expenses, and any potential "surprise" last minute expenses, in the event more guests turn up last minute to the event. FL offers several great venues for such events. Find a location with ample parking and restrooms to accommodate all guests. It is important to find a location which is large enough for everyone to move, and for us to set up the supplies and equipment for the event as well. Arena, a theater, sports parks, even beaches, are a few great places we have provided our services for picnics and corporate events to. Again, our personal planning specialists will discuss these details with you when planning the event, and can even provide you with examples or destinations for you to consider when they are setting up the details for your event with you. We want to be the partner in your function's success. You let us know how much or little involvement you want us to have, and we will oblige to your desires. Some corporate planning companies want the team at Big Lou's Bouncies to do everything for them; others simply want us to provide catered foods, tables, chairs, and supplies. You decide which extreme is right for you. You let us know how much or little you want us to do for you, and we can begin the planning process from there when working with your company. We will learn about your company during the first meeting. If you have blue collar workers, versus white collar employees, versus volunteers, and union workers, the type of crowd we are dealing with will differ. Further, if they are going to bring their spouses, their kids, friends, and other guests along, we have to take all of this into consideration as we are planning for the corporate picnic. And, we will ask you all the questions needed, so that we can plan the ideal day for all of the guests who are going to show up. 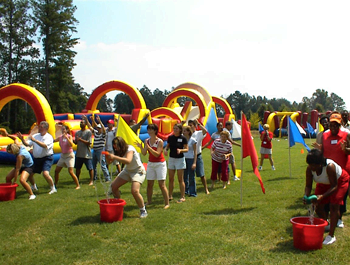 If there are kids, we can provide bouncers, carnival games, themed bounce houses, and more. If it is simply a corporate crowd, we can provide great music and ambiance, the great food, and the facilities needed for your guests. Again, each corporate event is going to differ, and depending on the type of guests which are going to be attending, we are going to help you decide what to do, and what to offer to guests, so as to ensure everyone is going to have a great time on the day of the corporate picnic which we are planning for you. Parks, union halls, ballparks, and other venues, are a few of the places which we have set up corporate picnics in the past. We can do it at any of these, or any other number of set venues. Since venues book quickly we do have to plan in advance; this is one of the major details we will discuss when planning your event, especially if it is for a larger group of guests which is going to show up for the picnic venue. What you serve isn't as important as how it is served. Imagine setting up food trucks for thousands of guests, only for the most popular taco truck to run out of food. Now what do you do? This is something we will discuss before hand and during the planning stages of your event. Not only will we help come up with the perfect menu options, but ensure the foods are properly heated (or cold), there is sufficient food, and we will plan what to do in the event some items are more highly desired than others. At Big Lou's Bouncies we work with choice vendors, to ensure service is fast, quality food, for a low price. Don't worry about planning a huge corporate picnic on your own. Contact us today and let us take care of all the minute details, so you don't have to!